Tiny homes and minimalist lifestyles are all the buzz. Choosing a full-time RVing lifestyle can meet your need to live small and save money, but the transition process isn't easy. 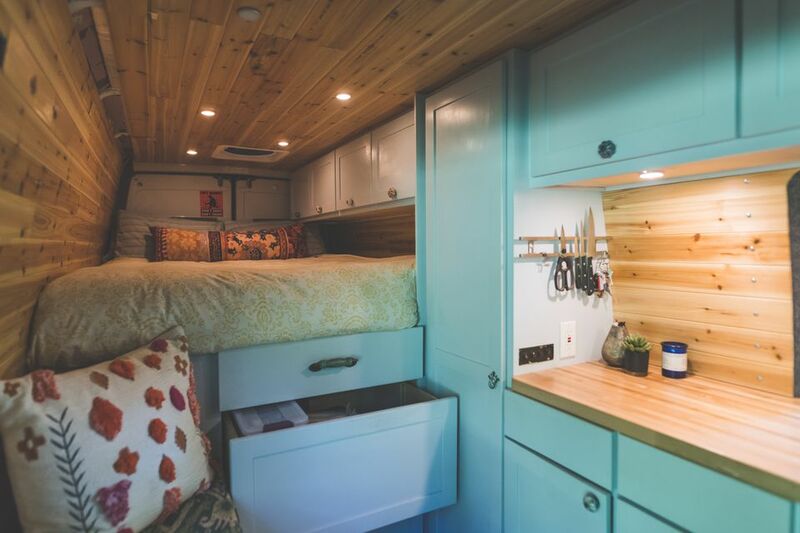 Scaling down from a multi-room house or apartment to a couple hundred square feet of living space in an RV can challenge even the most enthusiastic minimalist. Some adjustments seem obvious from the start, but others take time to learn. Think of these tips as a heads-up before you commit to full-time RV living or the blueprint for a mid-course correction if you find yourself feeling more frustrated than free on the road. The realities of RV living include having a home base, handling routine maintenance, and ways to conduct business as you travel. Finding a Home Base: Unless you plan to travel constantly, you need to find a convenient, affordable, and accommodating place to park your RV for a few days, a few months, or even longer. The US Army Corp of Engineers campgrounds are located in beautiful natural areas and usually have clean showers and bathrooms with basic amenities. Some campgrounds are more primitive, however, so do your research before you go. The Bureau of Land Management allows free camping in many areas and maintains paid camping facilities in developed campgrounds. The National Parks are, of course, one of the most popular places in the country for camping. Try visiting an NPS campground in the spring and fall months for fewer crowds and good weather. DIY Maintenance: Since you are living in a mobile home that most likely has a water system, you'll need to do regular maintenance. Learn to winterize and flush your RVs water system. Checking your RV electrical system from time to time is also important for basic maintenance. Pets on the Road: A mobile life needn't exclude your pets. Dogs and cats both make fine traveling companions, but it's important to make them comfortable in your camper without infringing on your own sense of space. Leaving the cat's litter box in the shower makes it accessible for your pet in a location where you won't trip over it. To prevent litter from going down the shower drain, cut a cheap foam yoga mat to fit the shower and placed it under the litter box. Turn a dog kennel for larger breeds into extra seating with a custom-cut cushion and throw pillows, or provide a kitty-cubby for your feline friend by removing the door from a small cabinet. Remote Office: Of course it's possible to work on the road with just a laptop and a back pillow on the bed. But if you need a more elaborate office setup, you'll want to find room for a desk. A built-in dinette table can do double-duty, but if you have the room, you might prefer a dedicated "office." Look for a place to tuck an elementary school-style desk with a built-in storage cubbyhole. It provides both a work surface and a home for your office supplies. Just be sure to attach it to a fixed surface so it doesn't go careening across the camper during travel. You could alternatively install a wall-mounted desk with or without a drop-leaf feature depending on your space. Tame the electronic tangle with binder clips to corral all your wires and cables. Gather the cords, fed them through the wire handles, then clamp the clips to the legs of the desk or another convenient location. Living tiny has its challenges including finding room for your things and organizing so you can find everything. Hanging Out: With space at a premium in any RV, no matter how luxurious, you need to get hyper-organized. Put things in their place with removable hooks that let you hang frequently used items under cabinets, in high corners, and from the curtain rods, shower rod, and other easy-to-access locations. Increase your closet storage potential with hanging organizer and shoe racks. Hang small items on the insides of your kitchen cupboard doors. Use hooks with suction cups to hang lightweight items on windows, a metal stove hood, or the refrigerator door. You can also put mini bag clips with magnets on metal surfaces to hold lists, coupons, restaurant menus, permits, and other paperwork. Stealthy Storage: When you start to look, you'll notice many small areas that could support creative storage options. The inside of the front door or any cabinet door can hold pouches, hooks, small plastic containers, or magnetic strips for storing smaller items. You can add hooks to the sides of shelves for hanging dish towels in the kitchen or clothing in the bedroom. Fabric or plastic shoe organizers can be cut to fit and hang in almost any unused space and hold items from shoes to toiletries to kitchen supplies. You can also custom-cut Velcro strips to mount small things to any blank wall. Attach cork board to the insides of cabinet doors for a place to hang spare keys, post emergency information, and pin up favorite snapshots from your journey. Find narrow, tall, storage containers to tuck into the many small, empty spaces in your RV. For example, a cardboard or plastic magazine rack can hold toilet paper rolls in the narrow space next to the toilet. You can save on the road if you are organized, creative, and join in with others. Bulk Up Without Overstocking: Buying in bulk for an RV differs from buying in bulk for a conventional home. You simply do not have the storage space to make large purchases. But if you team up with friends or neighbors at your campground or RV park, you can split commonly used products into manageable portions and save money by purchasing in the larger quantities. If you're a full-timer, it gets easier as you get to know other full-timers staying at the same park. Follow the Sun and Ride Like the Wind: After the cost of installation, operating a solar power system in your RV can save you a considerable amount of money. Even without solar power, camping in the sunshine can save on the cost of propane or electricity to operate a heating unit. Additionally, if you plan your travel to take advantage of the boost you can get from the wind, you can save a noticeable amount on gas. Drive with a tailwind instead of heading straight on, and you won't need to stop for gas as frequently, saving both time and money.